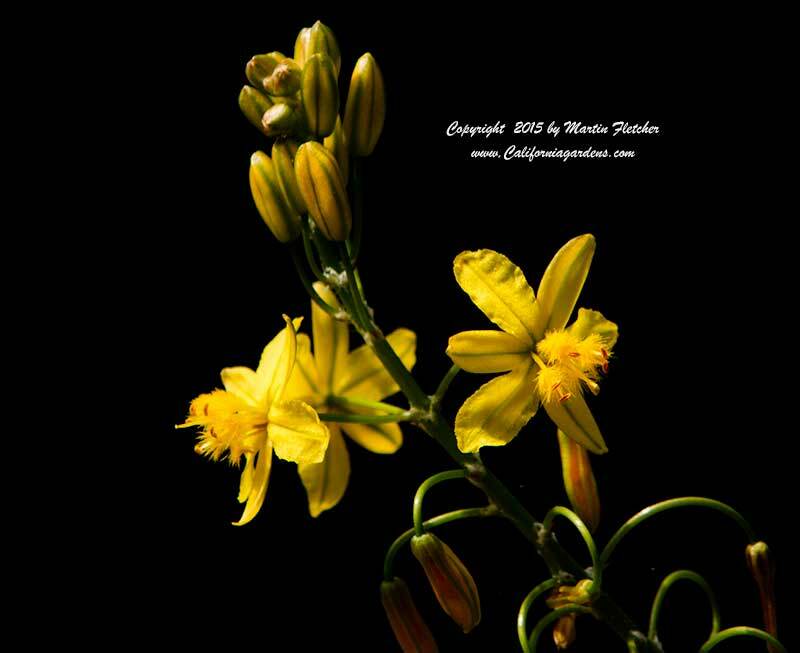 Bulbine frutescens blooms with yellow waves of flowers all year unless tipped by frost. The Stalked Bulbine grows tubular suculent foliage to about 18-24" tall and flowers up to a foot or so above the foliage. Bulbine frutescens will slowly spread a few inches per year rooting as it goes. In full sun there are more flowers and the folaige turns reddish when the plants are stressed. Bulbine frutescens will tolerate many soil types if the plants are allowed to dry out between watering cycles. The Stalked Bulbine will do well in light shade but will not perform well in a dark entryway. Bulbine Hallmark tends to be shorter with orange flowers and the orange pingment extends into the flower stalks. Bulbine frutescens is Winter hardy into the low to mid 20°'s. Flowers of Bulbine frutescens - Stalked Bulbine. High resolution photos are part of our garden image collection.